Fits most standard king pins. We highly recommend War-Lok Locks for better security. Made from cast iron, this Economy King Pin Lock fits most standard king pins. 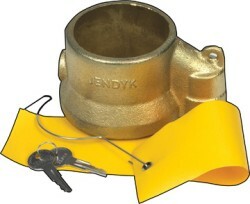 Its plunger-like design enables workers to place the unit in position without having access to the key.